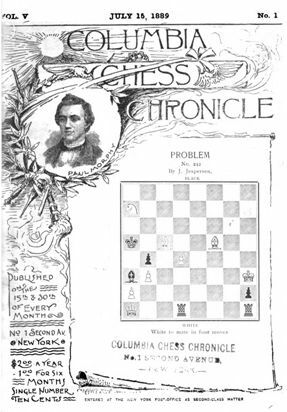 In 1888 the “Columbia Chess Chronicle” professed to be “The Only Weekly Paper In America Devoted Exclusively To This Intellectual Pastime”. It was published every Saturday at the Columbia Chess Club, No 1 Second Avenue, New York. The above mast head of the Chronicle dated July 15, 1889 bearing Morphy’s picture is typical for many of the 1888 issues that carried the member interchange about the famous "Morphy Anecdote". 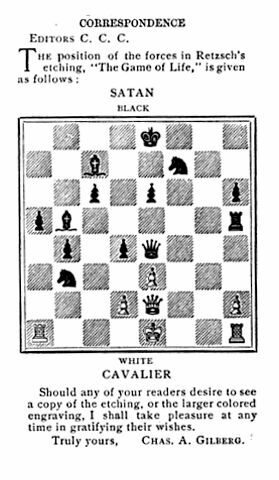 The popular story that the king has one more move is recounted again and again even today about a chess master (often unnamed) who “encounters” a copy of the Moritz Retzsch painting "Checkmate" (originally titled Die Schachspieler “The Chess Players”) in a museum. He closely examines the chess board and realizes the young man’s chess position is not nearly as hopeless as one might first imagine. The "one more move" story was first recounted in print on page 60 of Volume III, Number 7, 8 of the Columbia Chess Chronicle dated August 18, 1888. The article was entitled “Anecdote of Morphy”. The original full text of the anecdote as it was originally published in that issue of the Chronicle is also provided below. The original "one more move" anecdote appears to indicate that, unlike many of today’s modern day versions of the story, more than one move was likely necessary to “save” the young man. But that minor discrepancy is easily excused by the natural tendency to slightly embellish what later letters to the Chronicle's editor reveal to be an substantially true and accurate story. Retzsch’s painting as well as his various early engravings of “The Chess Players” were both popular at the time the Paul Morphy one more move anecdote was first published in the Chronicle. That fact is confirmed by a response to the original anecdote found in the later September 8, 1888 edition (Volume III, Number 10). 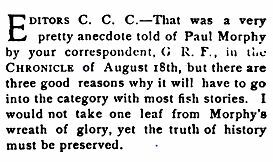 On page 84 of that edition of the Columbia Chess Chronicle is found a response to G.R.F.’s previous “Anecdote” about Morphy’s encounter with the painting. The writer “Dayton” states that he was in possession of a copy of a line engraving of “The Chess Players” by Retzsch. He expresses doubt about the Morphy one more move story because his copy of the line engraving does not provide sufficient detail of the exact placement of the pieces on the chess board! Dayton’s letter to the editor resulted in a later response by someone identified only as "F.G.J." 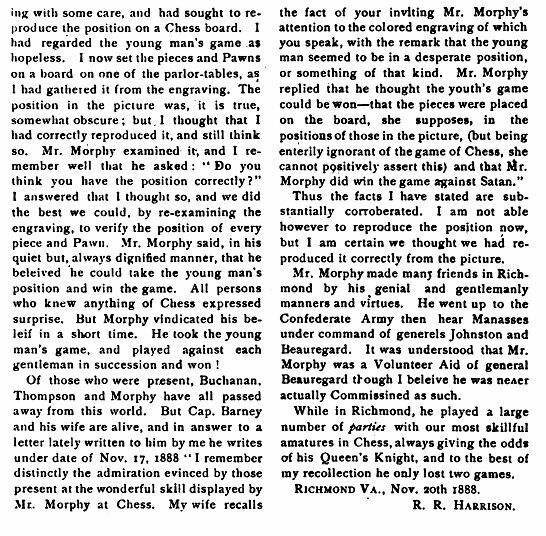 on page 93 of the September 15, 1888 edition of the Chronicle offering support for the original Morphy anecdote. F.G.J. 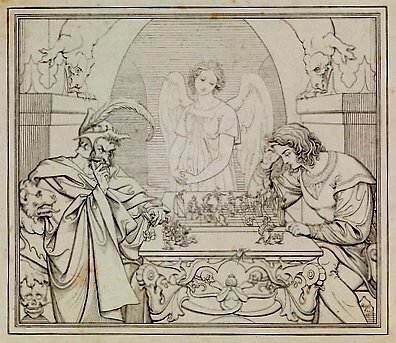 suggests the particular engraving owned by Dayton might not show the particular chess pieces as clearly as the copy of the Reverend Harrison’s painting. A copy of F.G.J. 's letter as posted in the Chronicle is also provided below. 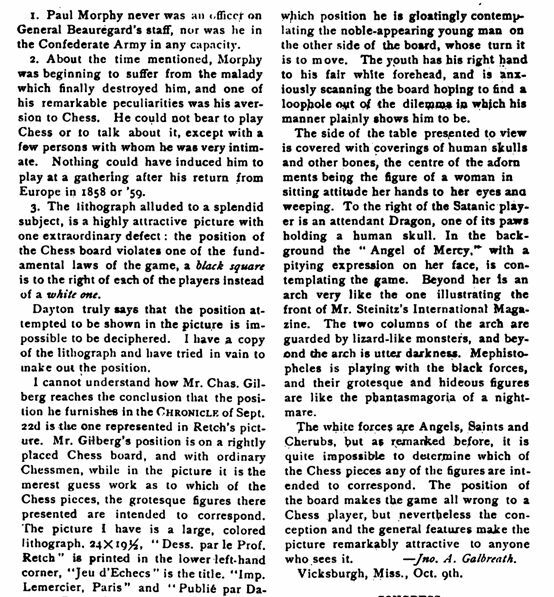 Three More Objections To the Morphy Story Are Raised By "Galbreath"
Beginning at the bottom right on page 136 and continuing onto page 137 of the October 20, 1888 Edition (Volume III Number 16) of the Columbia Chess Chronicle another critic of the Morphy story surfaced. One "Jno. A. Galbreath of Vicksburgh, Miss." He offered three specific criticisms of the original Morphy anecdote. A copy of Galbreath's letter to the Chronicle found on those two pages is also provided below. Read down through all parts of the left hand column for continuity and finish with the column on the right. 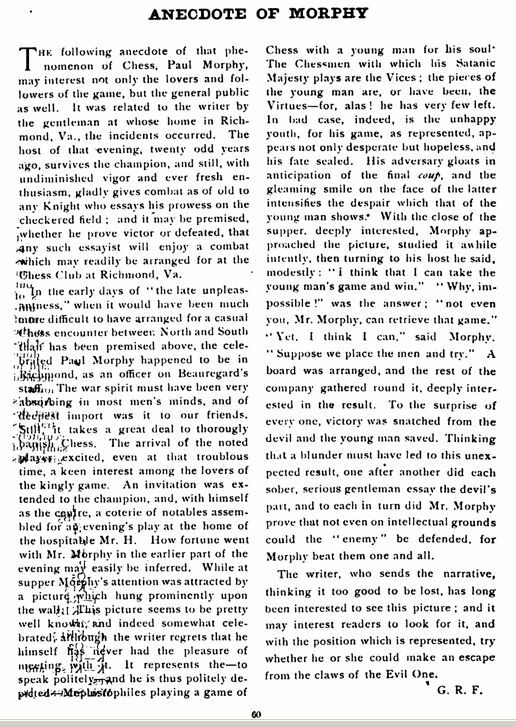 On page 142 of the October 27, 1888 issue (Volume III, Number 17) G.R.F., the person who first posted the Morphy story in the Chronicle, (later identified as Gilbert R. Frith) resurfaced in support his earlier original anecdote stating that the veracity of the person who told him the story about Morphy's encounter with the Retzsch painting was “unquestionable”. GRF’s letter to the editors of the Chronicle is also found below. A final submission to the editors of the Chronicle in support of the "Morphy Anecdote" appeared in the January 3, 1889 issue (Volume IV, Number 1) on page 3 by its author Gilbert Frith. To view that page of the Chronicle on-line, first click here and then scroll forward three pages to the 3rd page of the first issue in January of 1889. Frith first states his belief in the fact that Gilberg (in the September 22, 1888 issue of the Chronicle) had sufficiently refuted any objection to his story that someone like Morphy was unable to discern the position of the pieces on Retzsch's chess board. He then advises the Chronicle's readers of the willingness of none other than Morphy's host in Richmond the Reverend R.R. Harrison to refute Galbreath's other two objections to the Morphy story previously found in the October 20, 1888 issue of the Chronicle. 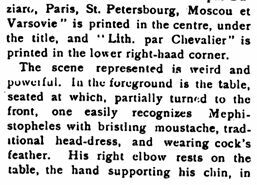 In addition to the on-line Columbia Chess Chronicle link provided above, Gilbert R. Frith's last submission in support of his story about Morphy and Retzsch's painting is set forth below. The Reverend R.R. Harrison (previously a prominent lawyer in Richmond Virginia) was willing to discard the anonymity originally provided to him by Frith in the original anecdote. In an extensive two page letter to the Chronicle the Reverend Harrison verified the basic facts of the Morphy story told by Frith in the original posting of the anecdote. He also corrected the date of Morphy's visit to Richmond and Galbreath's first objection that Morphy did not serve on General Beauregard's staff in the confederate army. Harrison's two page letter begins on the last page of Frith's letter. If you are no longer viewing Frith's last letter on-line, click here and scroll down four pages. The complete text of the Reverend Harrison's two page letter to the Chronicle is also provided below. There a number of significant facts in Harrison's personal account that tend to corroborate the veracity of the Morphy story. He lists, for example, a number of highly respected eye witnesses who were physically present in his home on the evening Morphy purportedly won the chess game for the young man. 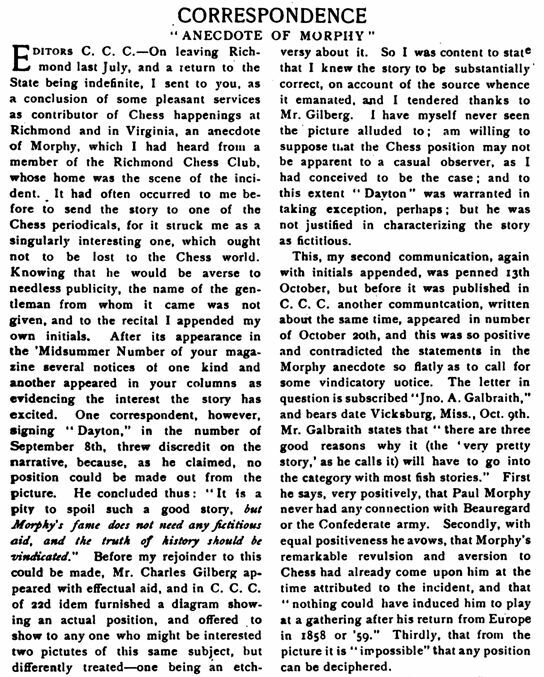 Harrison also points out that the occasion of Mr. Morphy’s visit to the Richmond Virginia area did not occur in 1868 (as erroneously stated by Mr. Frith in his initial account of the event) but rather in the autumn of 1861 thereby effectively refuting point #2 of Galbreath’s October 20th letter to the Chronicle suggesting the Morphy story was not true because it took place in Mr. Harrison’s home at a time when Morphy had allegedly lost interest in the game. The Reverend Harrison offered further corroboration of the above facts by referencing a letter he had recently received on November 17, 1888 from a Captain Barney who had been present with his wife at Harrison’s home that night, had witnessed Morphy’s easy defeat of the position of the Devil’s chess pieces in Retzsch’s lithograph and who had further corroborated the truth of the original anecdote! 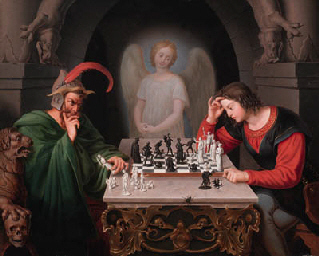 Galbreath’s objection that the chessboard was incorrectly presented in the Retzsch painting or illustration is not addressed at all by Harrison. That particular objection apparently did not require comment. A review of the painting sold by Christie's in October of 1999 shows the chess board to properly display a white square to each player’s far right. 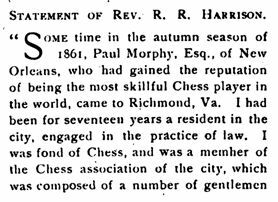 All of the above posts to the cited issues of the 1888 & early 1889 Columbia Chess Chronicle should be a source of great satisfaction for the legitimacy of the Paul Morphy story to anyone who has ever told the story of a chess master's defeat of the Devil's chess position in the Retzsch masterpiece. It should be a source of additional satisfaction for any inspirational speakers or Christian ministers and pastors who have, at any time, offered their own version of the Paul Morphy story (no matter how creative their particular version might have been) to now know that the Reverend R.R. Harrison, the man who was the original source of this fascinating and remarkable story, not only became a man of the cloth after a legal career but successfully defended the truth of his original story before all readers of the Columbia Chess Chronicle!